APPLICATION: Backboard or Shelf Mount. The RK-2U is a versatile equipment rack designed to mount to any flat surface or to sit on a shelf. The rack holds standard 19" rack mounted equipment 2 RU in height. Threads for either US #10-32 or metric M5 rackscrews are provided. 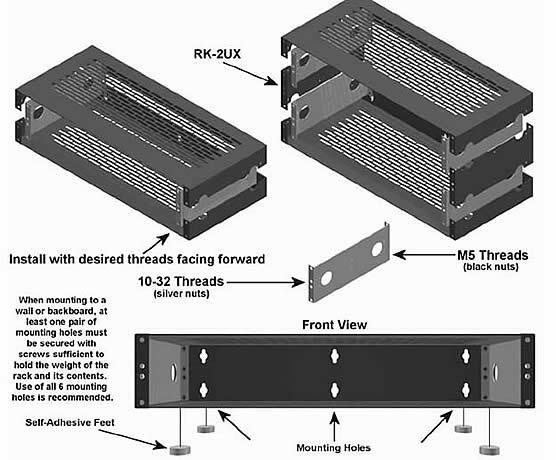 The RK-2U is ideal for mounting RDL racking accessories and modules and many industry products. APPLICATION: The RK-2UX is an extension kit that adds 2RU in height to any RK-2U. Multiple kits may be added to an RK-2U to make it any height.